How to approach your journey to a more productive project enterprise. Moving to Project Business Automation is not an all-or-nothing proposition. That is why we suggest approaching it in two steps that can be accomplished in phases. 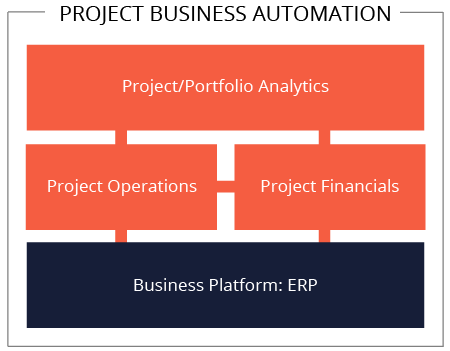 Your first step toward Project Business Automation is bringing project financials into your ERP. Many companies use Excel or another cost management system to run their project financials and get a thorough understanding of their portfolio budgets, forecasts, and earned value analysis. Bringing that process inside your ERP eliminates errors and delays in reporting. Cost control becomes more efficient and effective. Getting started with this first step is the most important. The second step in your journey to Project Business Automation is bringing project operations (planning) inside the ERP as well. This final step unifies everything so it all works seamlessly together in real time. For example, changes made to the project schedule are automatically reflected in procurement, the payment plan, EAC, and cashflow projections. Once both of these disciplines are being handled in the Project Business Automation system, project and portfolio analytics will be completed as well. Automating the connection between project operations and project financials is the key to providing comprehensive real-time visibility into your project business. ADEACA makes it easy to get started by providing you with a comprehensive project financial solution to achieve the first step. This first step consolidates project accounting and cost control processes, laying the foundation for eventually integrating project operations. The second step of moving your operation system inside the ERP is somewhat controversial to many in certain industries because of long traditions and reliance on a preferred planning tool, such as Oracle Primavera or Microsoft Project. However, while Primavera (as well as Microsoft Project) is a great tool for planning, it’s lack of integration and process enforcement does nothing for project financials or top leadership who need to understand the operational and financial sides of the business simultaneously. ADEACA ONE Project Business Automation utilizes project management best practices so your managers will be familiar with the tools included and easily adopt the system. You will achieve practices on par with or superior to Oracle Primavera or Microsoft Project. ADEACA ONE Project Business Automation also allows you to easily export into Primavera or Microsoft Project format so you can interchange your data with customers and partners without difficulty. As a result, the journey to Project Business Automation is easy. Download this eBook on the topic of PBA for project managers and the PMO and the top 5 reasons you should consider moving your organization to PBA. Find out why leaders like you in other organizations have moved to PBA. Built on Microsoft Dynamics 365FO ERP Cloud Platform, Best of both Worlds. Optimize your project financials and operations together. Make real-time, data-driven decisions for your company. 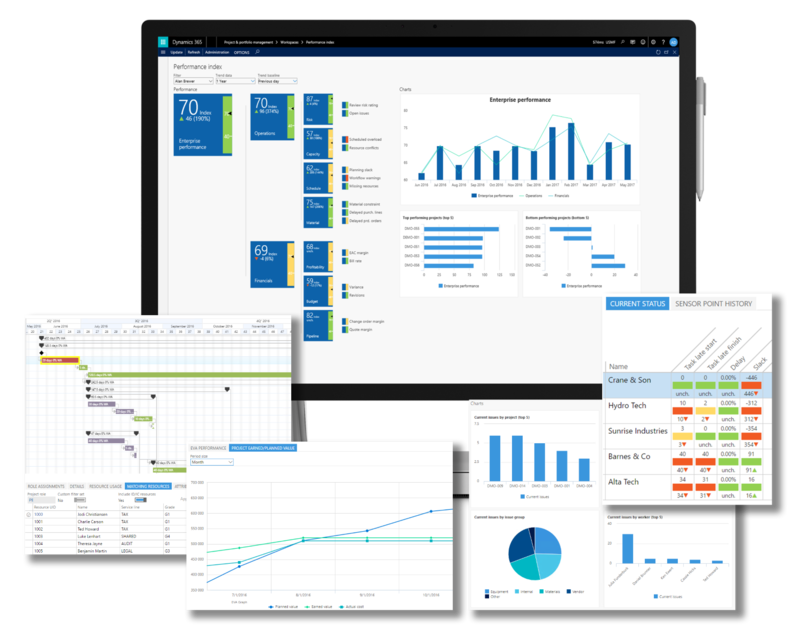 No.1 in Project Business Automation, built on Microsoft Dynamics 365FO.